← Ever Wondered Just How Old Or Fresh Your Eggs Are? I always enjoy a nice warm glass of tea and I also enjoy different flavors and kinds of teas. I did not know that different types of teas should be steeped at different times to give optimal flavor. I found this chart and read more about it. I had always wondered why sometimes tea just does not taste just perfect and for the most part steeping times were the answer. Weak tea simply was because the time of steeping was too short. Strong and sometimes bitter tea was usually steeped too long. 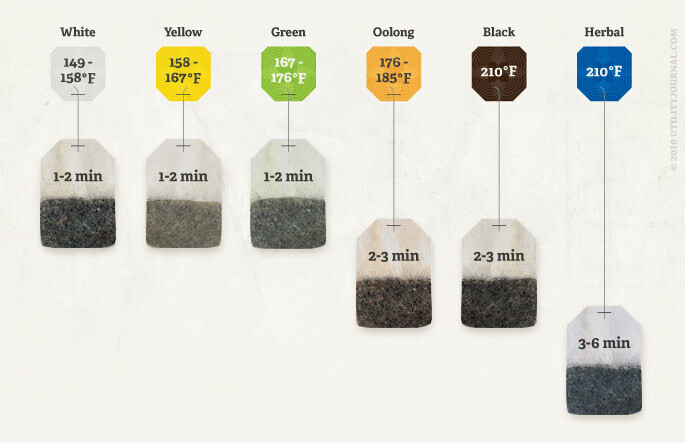 Use this chart and find the perfect steeping time for your favorite tea. This would be a good chart to keep in your recipe box or taped to the inside of a kitchen cabinet for easy reference. This entry was posted in Recipes, Tid-Bits & Funnies, ~Food and tagged bitter, black, Flavor, green, herbal, oolong, steep, steeping, strong, tea, teas, weak, white, yellow. Bookmark the permalink.